Here Are 12 Terrific Reasons to Love Turkey! Turkey is a nutritional powerhouse! That’s why we call turkey the ‘power protein’. Not only is turkey an excellent source of high quality protein, but also it’s lean and nutrient-rich (meaning it has a whole lot of nutrients per calorie). Turkey is packed with high quality PROTEIN. Protein can help crush cravings. Eating protein at meals can help you to feel satisfied and that can help you control your appetite and manage munchies. Protein helps with weight management. A high protein diet can promote muscle growth, calorie burning and satiety, all are important for achieving a healthy weight. It’s recommended that you aim for about 20 to 30 grams of protein at each meal to help you feel energized and satisfied, to build and maintain muscle, and to help manage a healthy weight. Each 100-gram serving of turkey has about 30 grams of high quality protein; enjoying turkey at your meals is an easy and delicious way to help meet your protein needs. White meat. Dark meat. Either way, turkey is LEAN. Love dark turkey meat but go for white meat thinking it’s a healthier choice? Here’s some good news! All turkey is a healthy choice, but you’ll be happy to know that dark turkey meat is lean, with just 8 grams of fat per a 100-gram serving. And, dark meat is especially rich in iron, selenium and zinc. Dark meat lovers rejoice!As for those who love the white meat, it’s considered a low fat choice. Each 100-gram serving of white turkey meat is extra lean with just 3 grams of fat. What about ground turkey? It’s also extra lean with just 8.7 grams of fat per 100-gram serving. Ground turkey has just over half the fat of lean ground beef, making turkey an ideal choice for your healthy barbecued burgers! So as you see, all fresh turkey cuts (without the skin) are lean or extra lean; but they do contain a small amount of fat…and that’s okay! Fat is needed to build hormones and to absorb the fat-soluble vitamins A, D, E and K.
We need fat for healthy skin. Fat also helps you feel satisfied after meals. Most of the fat in turkey is monounsaturated and polyunsaturated In fact, almost half the fat in turkey is monounsaturated – that’s the same type of fat found in heart healthy olive oil! Tasty Tip: Keep the skin on turkey breast while cooking keeps meat moist and locks in flavour; removing the skin before eating keeps turkey breast a lower fat option. Turkey gives you a boost with energizing IRON. Iron is a mineral that keeps your body’s cells working properly, helps boost resistance to infection and helps your body to use energy. Iron delivers oxygen through your body to your muscles and your brain so you feel energized.Although Popeye might be known for eating spinach to get his muscle-energizing iron, he should be pairing it with turkey! That’s because turkey contains a type of iron – heme iron – that is easily absorbed by your body. All cuts of turkey contain iron, but the dark meat is a bit higher in iron than white meat. Plant foods, such as spinach, also contain iron – non-heme iron – but it’s not as easily absorbable by your body. Eating meat, such as turkey, boosts the absorption of plant-based iron. So, enjoying turkey on a spinach salad not only tastes great, but the turkey also helps your body to absorb the iron found in the leafy greens. Win-win! Turkey builds up your body with immune-strengthening ZINC. Zinc is vital for optimal growth and development. Zinc is good for your skin; it helps to heal wounds. Zinc is awesome for immunity: it helps build and strengthen your immune system. Zinc is needed to help you to taste and smell your food. An added bonus: turkey contains zinc that your body can easily absorb. Although you can get zinc from plant foods (e.g. whole grains), your body absorbs the zinc found in animal foods, like turkey, more easily. Turkey is naturally low in SODIUM. Sodium is a mineral that you’ve likely heard you need to reduce. While it’s true, many of us get too much of it, we do need sodium to stay healthy.Sodium helps regulate blood pressure and muscle and nerve activity. Although we need some sodium in our diet, too much can lead to health problems such as high blood pressure, heart disease and stroke. All fresh cuts of turkey are low in sodium. Choosing more fresh foods, like turkey, that are naturally low in sodium, and cooking more meals at home, are two smart steps you can take for good health. Tasty Tip: Since turkey is so flavourful, you don’t need to soak your bird in a salty marinade to make it tasty, like some other cuts of meat. Turkey is bursting with VITAMIN B12. Keeps your nervous system – the body’s electrical wiring – working well. Is needed for the development of your DNA and healthy red blood cells. Vitamin B12 is a water-soluble vitamin, meaning that it’s not stored in your body. You need to eat foods rich in vitamin B12 daily. Turkey – all cuts – is an excellent source of vitamin B12. * Since you need vitamin B12 every day, that’s another great reason to eat turkey any day, not just holidays! Turkey is chockfull of NIACIN. Niacin helps convert the food you eat into usable energy for your body. Niacin helps enzymes (natural chemicals in your body) to function properly. Turkey – all cuts – is an excellent source of niacin. 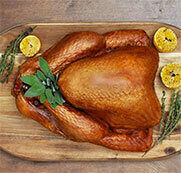 Turkey supplies you SELENIUM for healthy skin. Selenium is a mineral that loves your skin! Selenium works as an antioxidant that helps protect all your cells from damage and as such, plays a role in healthy skin.Selenium is also needed to keep your immune system and your thyroid working at their best. Selenium is also being studied for its role in prevention of cancer and for its potential in protecting age-related decline in brain function. Although more research is required, continuing to eat foods with selenium, such as turkey, is a smart choice. Turkey delivers bone-building VITAMIN D.
Vitamin D is known as the sunshine vitamin. That’s because your body can make vitamin D through exposure to sunlight on your skin. Vitamin D is found naturally in only a few foods – turkey being one of those foods.One of the main roles of vitamin D is to partner with calcium to build and maintain strong and healthy bones and teeth. In fact, vitamin D recommendations increase for older adults (71years+) in order to help reduce risk for osteoporosis. Vitamin D can also help you fight off infections as it plays an important role in keeping your immune system healthy. Vitamin D is also being studied for its role in reduction of risk for certain cancers, such as colorectal cancer; however, more research is needed to understand that role. Move over sunshine; many cuts of turkey are a source of Vitamin D! Turkey provides you with heart healthy POTASSIUM. When you think of potassium, what food comes to mind? If you said bananas, you’re probably not alone. Bananas are known for being high in potassium. But, bananas aren’t the only food that packs a good potassium punch. A serving of light turkey meat has the same amount of potassium as a small banana! *Potassium is an essential mineral that helps regulate fluid balance, heart function, blood pressure, and nerve and muscle activity. You may have heard that reducing sodium is important to lowering blood pressure. Well, increasing intake of potassium is also important. That’s because potassium counteracts sodium; a higher potassium intake can help reduce the amount of sodium that your body retains. And that can help to keep your blood pressure healthy. All fresh cuts of turkey are low in sodium and a source of potassium, so eating turkey, as part of a healthy diet, is a good choice in keeping your blood pressure lower and your heart healthy. * 100 gram serving of light turkey meat has 364mg potassium; 1 small banana has 362 (Canadian Nutrient File, v2015). Turkey is filled with PHOSPHORUS. Phosphorus works with the B vitamins in helping your body to convert food into energy. Phosphorus helps your body to make the protein it needs for growth and maintenance of all your body’s cells. Phosphorus is one of calcium’s partners in building strong, healthy bones and teeth. TRYPTOPHAN in turkey does NOT make you sleepy! Have you ever felt drowsy after eating a big turkey holiday dinner? Urban legend tells the tale that the sleepiness you feel is due to the tryptophan in turkey. That’s a myth!Here are the facts: Tryptophan is an amino acid found in small amounts in all protein foods, like turkey, milk and eggs. Tryptophan can act as a mild sleep-inducing agent, but it’s most effective when it’s on its own (e.g. in a pill). The small amount of tryptophan in foods, including turkey, doesn’t have that same effect. So what’s the real culprit to post-meal drowsiness? It’s more likely a combination of eating too much food and drinking alcohol.